Thanksgiving: Did you already know? Bill Bryson is one of my favorite writers. Here is a brief excerpt from Made in America: An Informal History of the English Language in the United States (1998). “When a celebration was deemed in order, the Puritans were delighted to let their hair down. The first Thanksgiving feast went on for three full days and involved, in addition to copious eating and drinking, such diversions as stoneball, a game similar to croquet, and competitions of running, jumping, arm wrestling, shooting, and throwing. No one knows quite when the first Thanksgiving took place, other than it was sometime between the beginning of October and the first week of November 1621. Nor was it regarded as the start of an annual tradition. “No Thanksgiving appears to have been held the following year, and the Plymouth colony would not begin regular celebrations until almost the end of the century. 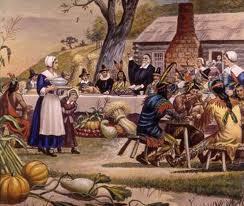 For the rest of New England, Thanksgiving didn’t become an annual tradition until about the 1780s. For the nation as a whole, Thanksgiving wasn’t fixed as a holiday until President Lincoln so decreed it in 1863. The date he chose was August 6. Bill Bryson was born in Des Moines, Iowa. For twenty years he lived in England, where he worked for the Times and the Independent, and wrote for most major British and American publications. His books include travel memoirs (Neither Here Nor There; The Lost Continent; Notes from a Small Island) and books on language (The Mother Tongue; Made in America). His account of his attempts to walk the Appalachian Trail, A Walk in the Woods, was a huge New York Times bestseller as was A Short History of Nearly Everything. His latest book is One Summer: America, 1927. He lives in Hanover, New Hampshire, with his wife and his four children.